can I leap to soar. to change the winds of the world. NOTE: This prayer holds wisdom from the acred Feminine School of Wisdom. Here’s a preview: When we want to fly to our dreams, many of us tries to find the means outside. We do things to change things in our external environment. But it does not work like that, and Butterfly shows us why. 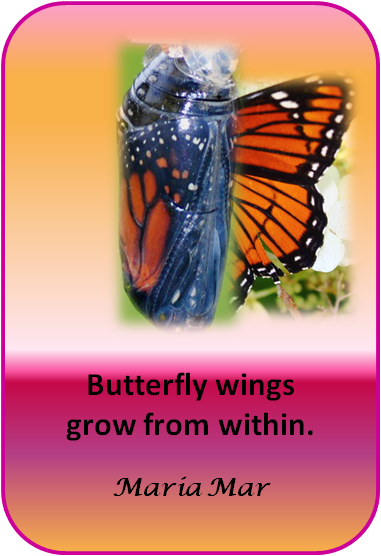 Our wings grow from within, through Internal Actions, like allowing, receiving, releasing, embracing. They grow through our change of perception and the release of old stories. They grow by us embracing and owning our gifts, authority and influence in the world. 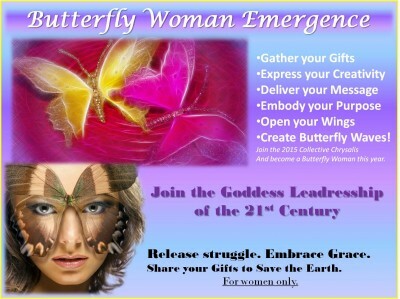 For more information on the Butterfly Leadership and the Sacred Feminine School of Wisdom, read below. To find out more about the Butterfly Woman Leadership, click here. The Butterfly Woman Emergence Program champions and guides women to make waves that change the world by sharing their gifts, embodying their purpose and living and working in delight. Read more here. This poem/prayer is the intellectual property of Maria Mar©2015 and is protected by International Copyright Law. You are not allowed to copy, paste, distribute, reproduce or appropriate this poem. For permission contact the author. You are invited to share with your friends through the share buttons in this page. Thanks! If you like my poems and prayers, you can receive them into your email box by subscribing to my Life is Poetry Newsletter. Monthly selections of the poems from my blog and notices of new Poetry Transmissions or poetry magazines or books.